Bhuj is one of the most beautiful towns in the state of Gujarat. Famous for its historical monuments and handicraft work of embroidery, leatherwork and tie-dye, Bhuj is definitely a weekend getaway from Ahmedabad. When you have the opportunity of witnessing historical as well as artistic beauty, why not a trip from Ahmedabad to Bhuj? Located in the Kutch district of Gujarat, Bhuj has a glorious past and legendary buildings standing strong for centuries within its boundaries, which are testaments to the fact that Bhuj has always been a major political centre since its formation. Bhuj experiences a hot arid climate and witnesses very little rainfall. Therefore, it is advisable to avoid visiting Bhuj during the summer season. 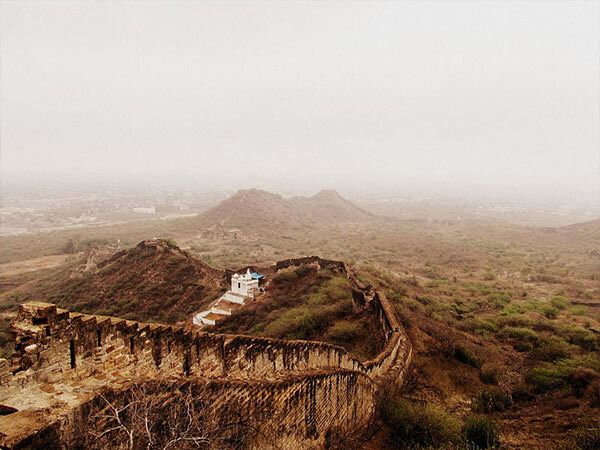 If you want to roam around comfortably, then the best time to visit Bhuj is from October until the end of March when the mornings and evenings are cool, letting you explore the beauty of town delightfully. By Air: You can take a direct flight from Ahmedabad to Bhuj. It will take an approximate time of 4 hr to reach Bhuj airport. By Rail: There are direct trains available from Ahmedabad to Bhuj. You can catch a train from Ahmedabad railway station which will reach Bhuj station within 6 hours. By Road: Located at a distance of about 330 km, Bhuj is well connected to Ahmedabad by road; hence, it is easily accessible. You can either take a bus or hire a cab from Ahmedabad to Bhuj. However, route 1 is preferable as it will take around 5 hr 30 min to reach; whereas, through route 2 you will take around 7 hr to reach the destination. While on the way to your destination, you can take a break at the following places. Viramgam is a former princely state in the Gujarat district of Ahmedabad. Famous for its beautiful lakes and ruined historical monuments, Viramgam is a must-visit place if you are in and around Ahmedabad. On one side you can trace the history of this small town through the ruined corridors of forts and on another side, you can savour the charm of dazzling lakes, such as Gangasagar Lake and Mansar Lake, at the time of dawn and dusk. Dhrangadhra is a small historical town in the Surendranagar district of Gujarat. With its history dating back to the Stone Age, this historical town is one of the oldest living places in Gujarat. Even though several monuments are in deteriorating condition, it is still a town which attracts numerous bypass visitors on account of its ancient culture and traditions. There are more than 100 places of worship in Dhrangadhra along with several other spots, such as stepwells and palaces. Apart from roaming around the town and exploring its markets of handicraft, you can also visit the following historical places which certainly reveal the ages of Bhuj. The history of Prag Mahal dates back to the late 19th century. Located adjacent to Aina Mahal, this wonderful piece of architecture is known amongst tourists for its remarkable work. Made out of Italian marble and sandstone, it has several grand halls with a 45-feet-high clock tower from where one can frame the beautiful views of the city. Prag Mahal has also been popular amongst filmmakers for its historic beauty and several films have been shot in its compound. One of the most beautiful places in Bhuj is Aina Mahal which should not be missed if you love exploring the history in the lawns of the ruined monuments. With its walls made out of white marble and covered with mirrors and separated with gold laces, it stands as one of the unique palaces in Gujarat. Even though the structure has been severely damaged by an earthquake in 2001, it still attracts innumerable tourists. Why not take a tour around this magnificent palace? Located in the centre of Bhuj, Hamirsar Lake is a man-made lake existed since the last 450 years. It was built during the rule of Jadeja dynasty and since then, it has been attracting several nature lovers as well as numerous migratory and indigenous birds. Flourishing over an area of 28 acres, Hamirsar Lake also hosts a beautiful green garden in its centre. How about catching a glimpse of this marvellous beauty at Bhuj? Established in 1877, Kutch Museum, formerly known as Fergusson Museum, is the oldest museum in the state of Gujarat and is located opposite to the charming Hamirsar Lake. Ranging from several inscriptions to sculptures and embroidery to paintings, Kutch Museum has a vast collection of archaeological as well as historical artefacts. You can also find several weapons and musical instruments, such as nagfani and morchang. Would you like to travel back in time through the historical sections of Kutch Museum? Bhujia Fort is an ancient fort which is located atop Bhujia Hill and provides a panoramic view of the town. It was built under the rule of Jadeja dynasty to protect the town from attacks and invasion. Even though this hill fort is in the course of its downfall today, it is still a destination for several historians. How about getting yourself under its shades and gazing at its ruined beauty? You can also visit several other places of interest in Bhuj such as Tapkeshwari Temple, Swaminarayan Temple, Ramkund and Hill Garden which will provide you with a wide understanding of this historical town.